When using a respondent list on your survey you will be given the possibility to include personal information in your survey questions and e-mail message. This information can be anything that is included in your uploaded list, for example Department or Closest manager. By adding personal information in your e-mail message you increase the possibility of the respondent answering you survey. With the function Personalize e-mail you can add the name of the respondent in your e-mail message. Other information such as contact person can also be added. Gives your survey a personal touch. Makes the respondents feel important. Increases the possibility of the respondent answering your survey. Note: This function is not recommended to use when conducting sensitive surveys such as employee satisfaction surveys as it is important to guarantee the anonymity of respondents. 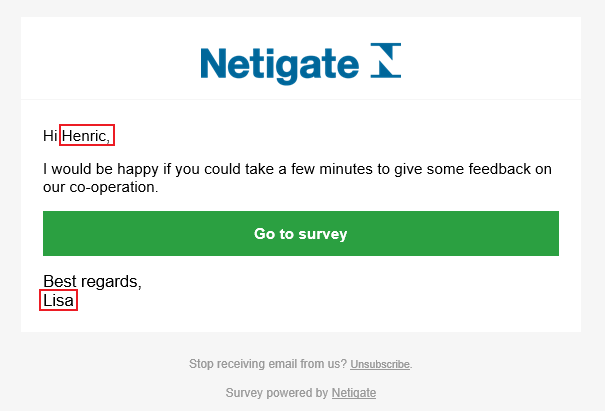 Create your survey as usual. Finish how your e-mail message should look like. The information you will use must be entered into an Excel-document and uploaded as a respondent list to your sendout. Make sure it contains all the information that you want to use, such as name of the respondent and perhaps the name of their contact person (could be the sales contact or account owner for example). To read more about how to upload a respondent list, click here. When the respondent list have been uploaded and saved to your sendout, go back to the e-mail text. You will now be able to see a small button called BGD in the HTML menu. Mark the spot in your mail text where you want the infromation to appear. As en example, start with the name of the respondent. Place your marker right next to the word Hi, enter a blank space then click the BGD button. A small menu will appear where you can choose from the different columns that you have uploaded to your respondent list. Pick the column containing the respondents name and click Insert. You will see a background data “tag” appear next to the word Hi. This tag will be replaced by the name of each individual respondent automatically when the survey is sent. The information is based on the data that you uploaded in your respondent list so make sure the list is correct before sending the survey. Once these steps are done you can do the same with Contact person, if you want to include that in the e-mail message as well. Note: The same method of adding background data tags can be used in the Introduction-, End– and Info-texts in your questionnaire. By adding personal information in your questionnaire can clarify any questions or doubts a respondent might have about the content of your survey. For example, if you have a question regarding your closest manager it could be some doubt to who that closest manager is and can easily be clarified by inserting the persons name in the question. Create your survey as usual. The information you will use must be entered into an Excel-document and uploaded as a respondent list to your sendout. Make sure it contains all the information that you want to use, such as name of the closest manager or department for example. To read more about how to upload a respondent list, click here. When the respondent list have been uploaded and saved to your sendout, go back to the e-mail, introduction-, end- or info texts of your survey. You will now be able to see a small button called BGD in the HTML menu. Place your cursor in the open text area and click the BGD button. A small menu will appear where you can choose from the different columns that you have uploaded to your respondent list. Pick the column containing the closest managers name and click Insert. You will see a background data “tag” appear in the text area. Copy this tag and insert it in the questions where you want to display it. This tag will be replaced by the name of each respondents closest managers when they answer the survey sent. The information is based on the data that you uploaded in your respondent list so make sure the list is correct before sending the survey.